BlackSquare builds and sells patented, real time transparent hardware encryption and key management devices we call Enigma. BlackSquare Enigma has the look and feel of a thumb drive, but it’s NOT a thumb drive! Data breaches and monitoring have become much more prevalent and sophisticated, frequent and costly. Whether your data is stored on your hard drive, backup drive, USB thumb drive or in the cloud, it’s more valuable than ever. BlackSquare Enigma is a simple, safe and secure way to protect your data from these daunting threats! Using BlackSquare Enigma, encrypted files and folders are easy to recognize. The small icon identifying the default program for each file changes to a black square with a “b²” in it and an additional file extension — .BKSQ (for BlackSquare) – will be added. 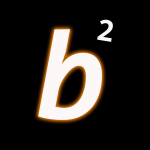 To find encrypted files, simply search the filename, or *.BKSQ! When you remove Enigma from your computer, all Enigma windows automatically disappear. All the recovery keys needed to decrypt your files reside within Enigma’s hardened security, not on your computer. No data is left behind for cyber thieves to use in their attempts to decrypt your files. Does NOT leave your password or key on your PC! Enigma is transparent to the operating system! Drag ‘n Drop, or Right Click – your choice! BlackSquare has provided a complete menu of features for both File and Folder operations. Use ‘right-click’ for menu driven options, or, drag the files or folders and drop them on the appropriate icon at the top of the page. BlackSquare’s Enigma encrypts and protects files on any storage device that can be seen by your computer — internal drives, external drives, servers, NAS boxes and cloud storage applications. IT, Security and encryption experts alike agree hardware encryption is faster and less vulnerable than software-based encryption. Until now, the problem has been finding a hardware solution that is easy to understand and simple to use. If you know how to find and select files on your computer, you already know how to use BlackSquare Enigma. It’s that intuitive. Just plug your Enigma along with any USB storage device into a USB port on your computer, log in and you’re good to go. Connect the Enigma device to any USB storage device for faster encryption speeds; you can also view all files, folders and directories on that device. 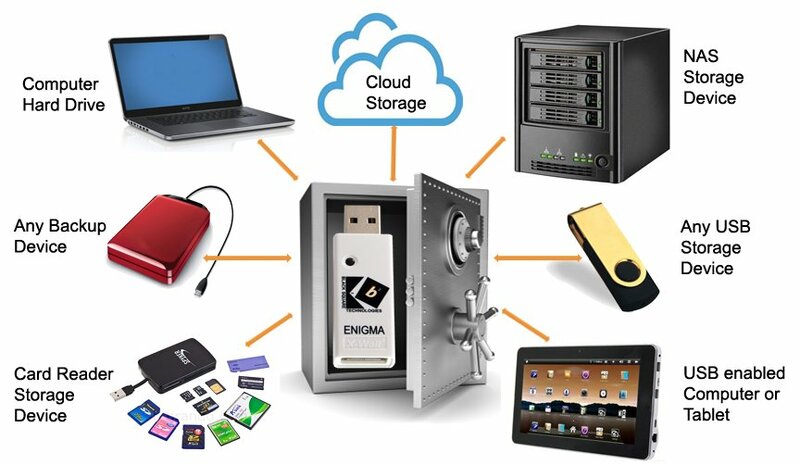 Enigma’s home page shows your desktop, cloud storage, and all or your drives, including NAS devices, servers, external and backup drives, and any USB devices which are connected to your PC. Navigating to find and manage files and folders is a snap. Your BlackSquare Enigma will go through an initialization process the first time you use it. It takes a minute or two. This process consists of connecting an external USB storage device to your Enigma and plugging the pair into your PC or MAC. You will be asked to initialize your Enigma. Click OK. Then create a strong password up to 32 characters in length. This will become your LOGON password. And the initialization of your Enigma is complete. If you lose your Enigma, simply replace it (you’re not S-O-L). Once you have initialized your new Enigma and recreated your LOGON password, you are good to go. Encrypt files that are of value to you. You can encrypt one file, multiple files, a single folder or multiple folders, all with a single click. You can encrypt and protect every file on your computer or within your network. The heart of the BlackSquare Enigma is our patented, Hardware Cryptographic Module, or HCM. Years of engineering, programming, coding, testing and debugging have gone into the development of BlackSquare Enigma. The patented HCM chipset is now in its 9th generation of development. Versions of BlackSquare Enigma have been sold into government agencies and large enterprise customers, where encryption of data-at-rest is both critical and required by law. 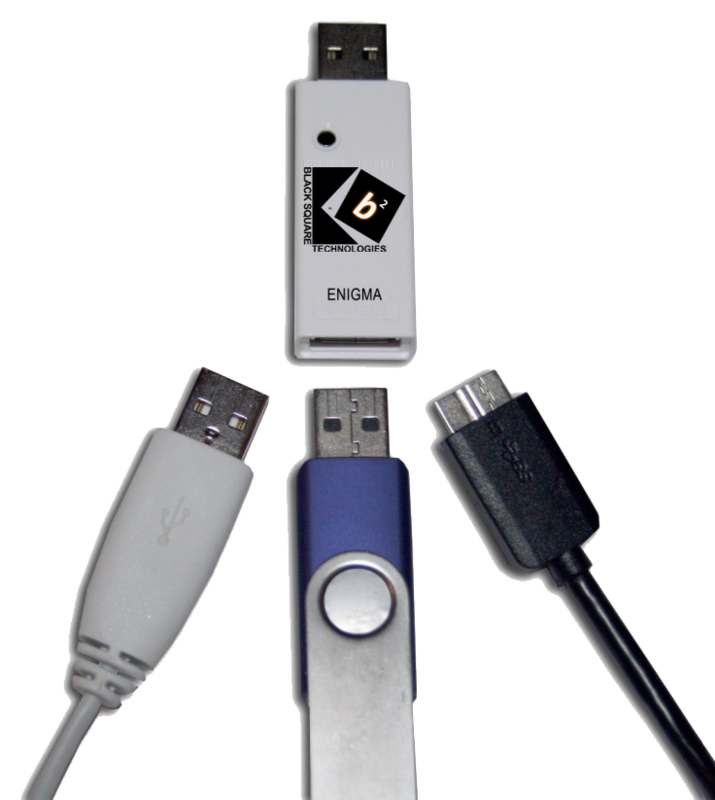 Compatible with both WIN and MAC operating systems and all USB protocols, BlackSquare Enigma is a complex, hardened and proven security device that’s intuitive and really simple to use. BlackSquare offers an optional annual subscription update service, The purpose of the service is to provide continuing updates and product features which have been extensively tested. The BlackSquare development team continues to improve the simplicity and security of Enigma to the user. If your computer or USB storage device has been encrypted using Enigma, your data remains safe at all times. If your computer or USB device were to become lost or stolen, that data cannot be decrypted without both an enigma and your personal password. It’s also important to remember that any data you encrypt and store in any cloud app will remain encrypted by Enigma!